Given the goodwill that they’ve generated since disbanding—the well-regarded reissues, documentaries, and legions of younger bands hailing them as influences—it’s easy to forget how badly Slowdive’s first run as a band ended. Their second album Souvlaki is now as much of a shoegaze ur-text as any My Bloody Valentine recording, but at the time it was just a mostly notable for the fact that it was made in a cannabinoid haze, in part, with Brian Eno. Following the release of that record, they drifted further into that stoned ether: According to the liner notes for a reissue of their third album Pygmalion, they were asked to deliver a pop record by the head of their label, and decided to do the exact opposite, releasing nine tracks of heavenly kosmische and ambient electronics—its opening track “Rutti” was over 10 minutes long. Then in February of 1995, the band—absent drummer Simon Scott, who left after feeling out of sync with the spacey new direction—released Pygmalion, a vaporous collection of electronic pieces. Previous albums had already made them scapegoats for everything the music press saw wrong with the subtle emoting of the shoegaze scene, but their newfound abstraction was a bridge too far for those who’d stuck around until that point. Their label Creation Records dropped them in the week following its release. One review suggested they “work on their headstone.” And so they did, ending the band shortly thereafter. When guitarist Neil Halstead moved from the home where he worked on much of the record, he left almost all of his clothes drying on a line outside and never came back for them. For the band to return to the title Slowdive after 27 years—a name also used on their first-ever release—suggests that, like for many bands who make eponymous releases deep into their career, the record is a reset button. Perhaps as a result, Slowdive feels simpler too. With all that the band has attempted over the course of the near three decades since their initial formation, they could have made just about anything. They’ve written opiated balladry, ambient techno, even oozing drones, and turned rock band instrumentation into jetstream engines. But here, the songs are conspicuously stripped down—lyrics are legible, guitars sound like… guitars. It’s an approach they haven’t really taken since their very first recordings, from the Slowdive EP through Just for a Day. The chiming drive of lead single “Star Roving” is so bare and uncomplicated that it feels more like the current generation of reverb-hazed indie bands than much else in their catalog (just search Twitter for “SlowDIIV”). 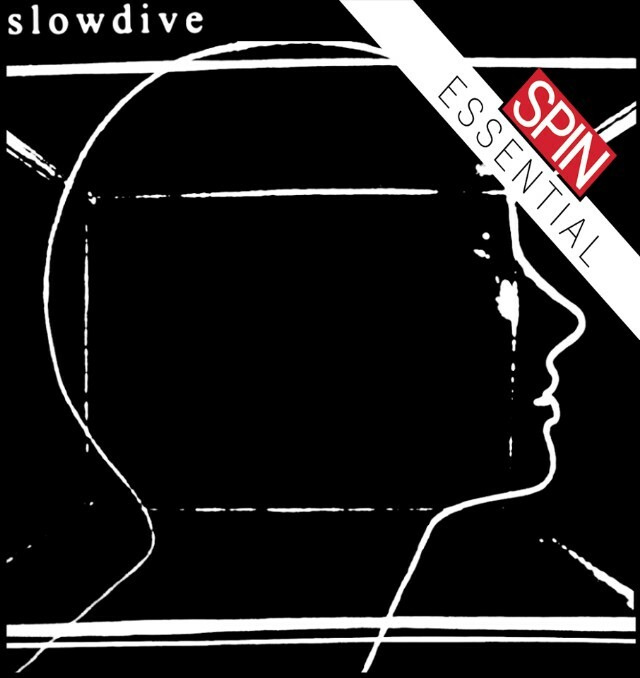 Because how intent they seemed on pushing at the borders between rock and electronic music during Pygmalion, and how charmingly amorphous and hard to grasp Souvlaki remains over 20 years after its release, it could be easy to take Slowdive as a retreat. But its surface-level simplicity only serves to highlight how experimental the band are as songwriters. Their best moments felt sort of like sleepwalking, linking together fragmented emotions and shattered scenes with vaporous chord progressions and a thick reverb mist. That’s why it makes sense for Slowdive to have cosmic rock songs (“Slomo”), minimalist piano dirges (“Falling Ashes”), and heavenly C86-isms within a few tracks of one another. When was the last time a daydream made much sense? Their lyrical images have always followed the same kind of fuzzy logic—a sober lecture becomes a burning cigarette becomes a wall of televisions. That slippery quality is echoed throughout the new material. “Sugar for the Pill” finds the band dealing in blurry imagery—caught in a “blizzard of gulls, drumming in the wind,” Halstead details a harrowing experience of feeling overcome by jealousy, running through darkness. The surreal images pile higher until, at the song’s pillowy climax, they deliver a sly explanation, “You know I had the strangest dream.” The narrative structure of nighttime reveries can often feel unsettling, but throughout Slowdive, the band use foggy images and slippery transitions as a soothing sort of déjà vu—you feel like you’ve been here before, even though you obviously haven’t. Since their inception, Slowdive’s music has always sort of felt familiar. That’s sort of what got them in trouble with critics the first time around, that their diffuse guitar heroics sounded so much like My Bloody Valentine and the rest of the so-called “scene that celebrates itself” that it wasn’t worth really digging into. But that thinking always missed the point. Even at their most out there, in their most experimental phases, their music was so great because it felt like something you’d heard before—a distant memory of rock records long since forgotten. As a stripped return to their earliest efforts, Slowdive may very well be their most comforting. It always feels good to come back home.